And how Portland and Seattle could play some serious catch-up. Editor’s note: This article is Sightline’s very first from our new senior researcher, Dan Bertolet. We’re thrilled to have him on board to help both continue and expand our work pursuing smart solutions to our region’s big questions on housing and urban growth. Read his full bio here, and follow him on Twitter at @danbertolet. Cascadia’s three largest cities have all sworn themselves devotees of the accessory dwelling unit (ADU)—also known as the in-law apartment or backyard cottage. But only one of the three has actually built any more than a smattering of them. In Vancouver, BC, fully one-third of single-family houses have legal ADUs; in Portland and Seattle, scarcely one percent of houses sport a permitted secondary dwelling. This yawning gap reveals a big opportunity for addressing future housing needs in growing cities. ADUs are relatively modest apartments or cottages integrated into single-family properties, and they come in two flavors: physically attached to the main house (AADU), or detached in a structure separate from the single-family house on the same lot (DADU). Most fall in the moderate affordability range—$1,200 to $1,800 per month for a one-bedroom unit in Seattle—and offer a housing option in single-family neighborhoods for residents who cannot afford a single-family house. Known as “granny flats” for a reason, ADUs work well for multigenerational families. And they are particularly well-suited for young children, because they tend to be relatively large (at least for a rental), provide direct access to outdoor yards, and are often located in neighborhoods well served with schools and parks. The table below shows the current ADU and single-family home stats for Vancouver, Seattle, and Portland. Vancouver has a staggering lead in AADUs, with more than 21 times as many in-law apartments (called “secondary suites” in Canada) as Seattle and almost 44 times as many as Portland. The city also holds an ample lead in DADUs (“laneway houses,” in Vancouver’s parlance). provides great latitude to property owners in terms of size, height, and placement of each ADU. Vancouver demonstrates a substantial housing opportunity for other cities. Matching Vancouver’s ADU track record would mean 47,000 ADUs in Seattle and 54,000 ADUs in Portland. Unfortunately, recent rates of construction in these cities would not yield that much for several hundred years. To seize the ADU opportunity and match Vancouver, Portland and Seattle will also have to match Vancouver’s welcoming set of ordinances. Seattle is poised for progress on ADU code improvements intended to unleash production through the recently introduced Housing Affordability and Livability Agenda (HALA). HALA calls for more ADUs and prescribes most of the regulatory improvements listed above. HALA also recommends establishing a “clemency program” to legalize undocumented ADUs, which amount to perhaps two or three times the permitted inventory. (The City of Seattle makes no attempt to count unpermitted ADUs). Like what you're reading? More on in-law units and backyard cottages here. Vancouverites built most of the city’s 25,000 AADUs over several decades starting in the 1970s—often in defiance of prohibitive regulations in place during much of that period. DADUs are newer to the city (the program launched in 2009), but production has been steadily rising, with a record 531 units permitted in 2015. Combined, the production rates observed in Vancouver for the two ADU types translate to something on the order of 1,000 homes per year. By comparison, Seattle has a goal of producing 20,000 affordable units over ten years, or 2,000 per year. The fact that both Seattle and Portland have roughly twice as many single-family houses as Vancouver to work with would suggest that both cities have the potential to surpass Vancouver’s ADU pace. And that’s enough new housing to take a serious bite out of the mushrooming unmet demand for moderately priced, family-friendly housing in these cities. The reason Vancouver is currently so far ahead on ADUs stems from the presence of two synergistic ingredients: low regulatory barriers and a strong real estate market. Together, these help owners justify the cost of building ADUs. Seattle has been lagging because while it has the market, it also has the barriers. And Portland has been lagging because while most of the major barriers are gone, it has had a weaker real estate market until recently. Given Portland’s strengthening market, an ongoing increase in ADU production can be expected, without any major code changes. In Seattle’s case, however, ramping up ADUs hinges on fixing the code. Fortunately the City of Seattle already has a plan, and the solution is straightforward: implement HALA’s recommendations. Like what you're reading? Get the latest Sightline housing research right to your inbox. Notes and methods: Vancouver data were obtained through a private communication (12/15/15) with staff at Planning and Development Services, who derived the AADU count from Census 2011: Statistics Canada. The DADU count is based on data collected by the City and includes only those with finalized permits as of 12/31/2015. The data source for the Seattle ADU inventory is here and includes ADUs with permits finalized between 1/1/95 and 10/2/15. The data source for the Seattle single-family house inventory is here. The total count of ADUs in Portland is based on a private communication (11/02/15) with staff from the Oregon Department of Environmental Quality. The estimated split of that total between AADUs and DADUs was derived by applying the percentages observed in this 2013 survey. The data source for the Portland single-family house inventory is here. Great article! A couple fact checks: Portland doesn’t require design review for ADUs (except in very limited geographic areas where this is required for all homes in historic districts). Portland does require a certain level of design match to the existing house for DADUs, but just made tat requirement more flexible and removed it entirely for 1-story ADUs. Also, Portland waived its owner-occupancy requirement for ADUs long before 2010 (1996 I think). Eli: Thanks for the helpful comment! You are of course correct, and I updated the post regarding design review and owner occupancy. Still another breathless article about the charm and sensibility of DADUs as though they were the answer to all things housing…if we would just subsidize them with tax and permit waivers. And why not amnesty for illegal ADUs, the ones wired with extension cords, garden hoses for plumbing and only one exit? Apparently the Fox concept of “fair and balanced” now applies to all things from sightline. Greg, your sarcasm doesn’t apply to the reality on the ground. Vancouver grandfathered in all existing “illegal” basement suites and applied basic Code requirements *because* of the unsafe wiring, etc., and because there was no way to evict people from 50,000 units without mass revolt. Metro Vancouver is also as land-constrained as Seattle or Portland, if not more so. Yet a million more people are expected to move here in the next 25 years and cohabitate on 820 km2 of land with the rest of us. The alternatives are to develop the watersheds, log the parks, level the mountains, fill in the ocean, and covert the Agricultural Land Reserve into plastic single-family subdivisions. Vancouver widely chose density, of which laneway houses (ADUs) are the gentlest form. There is a lot of land locked up in the setbacks of lots containing detached single-family homes. This is a question of geometry, demographics and efficient land planning as anything else. What is the capital gains cost on selling a primary residence with an accessory dwelling unit ? Could you add B.C. to the word Vancouver. Those of us who live south of Olympia feel slighted otherwise. Vancouver WA and Portland is a major hotspot of resistance to Fossil Fuel Infrastructure. Our coalition has stopped 11 fossil fuel projects, and we are helping to stop Gateway Pacific, Shell Anacortes and terminals in Grays Harbor, also. Thank you for mentioning this – particularly in the context of SW-WA and Vancouver. Maybe we should start using “SW-WA Vancouver” to distinguish this rather large city that gets left out of a lot of conversations. Vancouver is the third largest city in our entire country. Can’t we have the name without the suffix? You’re important… but come one. Also – imagine if London, Ontario called up london england and asked them to please add UK after their name….. Secondary units make it much harder for middle income families to buy housing since the 2nd unit makes the property more expensive. And if some say the rental income offsets the much higher purchase price, most of us don;’t want to be landlords so the housing is for the very narrow market segment that maybe hopes to become rich from being a landlord. If the units were separately deeded then they could be bought as an ownership unit rather than as another rental unit for some landlord to buy and get rich on the appreciation and rental income. The housing system is severely broken in the US, Canada and many other countries. Landlords are given all sorts of tax subsides – really direct welfare payments – while tenants are forced to pay higher rents, making it ever-harder to buy a home. Let’s fix the housing system first by (1) eliminating all tax subsidies currently given to landlords and speculators (interest write-offs, low capital gain taxes, tax-free exchanges, etc); (2) enacting a new tax on rent incomes starting above say $30,000 per year, with progressive tax rates ranging from 5%-20% on gross rents, less maintenance costs; and (3) enacting very high capital gain taxes in excess of 65% whenever rental property is sold or transferred, and no “tax basis step-up” at death. Society needs to end this feudalistic society by making taxes lower for tenants and home-owners, and much higher for landlords and speculators. Canada Bob – There’s a WA city next to Portland also called Vancouver. The suffix helps confirm the city ID although 9 of 10 times you’re right, we should be able to figure out it’s Vancouver BC. Using that logic, we should ban all housing improvements. No swimming pools, no second floor addition, no new kitchen, ban it all. Even improvements like landscaping should be discouraged. As it is, the tax code benefits home owners in this regard. If I sell my house for more than I bought it, I have to pay a capital gains tax. But I get to deduct the costs of whatever improvements I made. So now I get to deduct the cost of the walk in closet, the new master bedroom and the nice kitchen. But all of that really has a minor impact on the cost of housing. There is really little that can be done to keep the price of single family houses down, once you have a hot market. You can, of course, subdivide lots and otherwise chop up a place, and add more houses. That is, essentially, what an DADU is. A second house squeezed in next to the other one. But right now, in Seattle, the opposite is happening. Small houses are being torn down and being replaced by bigger ones (so called monster houses). These are legal, and have few restrictions, while adding density requires jumping through hoops. All of this simply increases the cost of all types of housing. Renting a house is very expensive because there are only so many places to live. Having more ADU/DADUs would help that situation immensely. If renting a house is a bit less expensive, then owning one (or owning an apartment) becomes a lot less expensive as well. That wasn’t our experience. Sure, the property may have been a bit more expensive but the rental income was put directly on the mortgage. They don’t call them mortgage helpers for nothing, and that has become crucial in Vancouver (BC’s) increasingly overheated housing market. We don’t currently rent out the suite any more, but that is always an option if we need the income again, and it remains an attractive feature to potential buyers. Great article and glad you’ve joined the Sightline team! Through legislation, political will and an effective promotional campaign, Vancouver, BC has had great success with AADU’s and Laneway Houses (DADU’S) as you’ve noted. However, with respect to the Laneway Houses, Vancouver has some significant advantages over Seattle and, perhaps, Portland. First, nearly every block in Vancouver has a lane (alley) whereas alleys are the exception, not the rule, in Seattle. This means that in Seattle access to the DADU must pass by the principal dwelling compromising privacy for both units. Second, the typical single family lot in Vancouver is narrower (around 35′) than in Seattle, however, it is about a third deeper (around 135′). This allows for a deeper backyard with more space for the DADU and a yard between it and the principal dwelling. In fact, the minimum required separation between the DADU and principal dwelling in Seattle is 5′ while it’s 15′ in Vancouver. This has also led to a very interesting Vancouver SF parcel configuration in which the principal dwelling is comprised of two units, one facing the street with access to the front yard and one facing the rear yard with access to it. The DADU then has access to the alley. 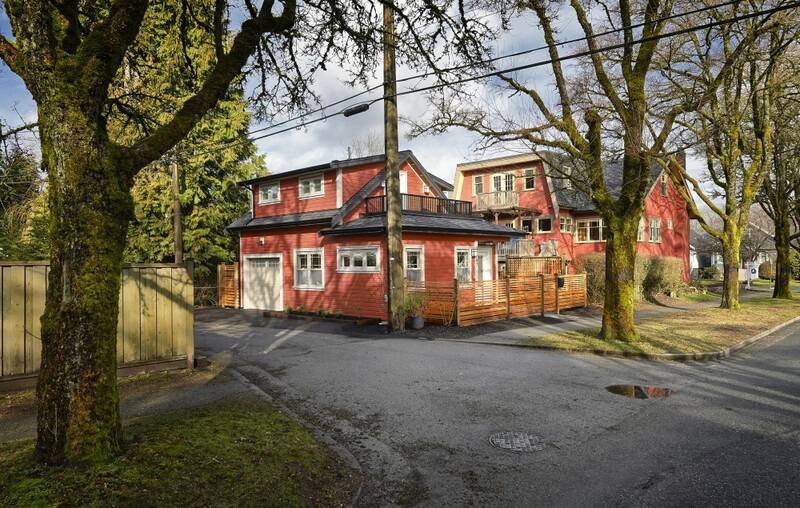 This yields one single family parcel with three ground related units that appears to be a single family dwelling with a laneway house or backyard cottage. I’m not suggesting that we shouldn’t follow Vancouver’s lead, we should. However, they have a significant advantage with respect to urban morphology. One way Seattle could improve upon its circumstances would be to allow DADU’s to be on the side or rear property line with approval from the neighbor, which is currently allowed for detached garages but not other detached accessory structures. In fact, if two neighbors were to jointly build two DADU’s with a shared wall they would both benefit from increased usable space in their respective rear yards and decreased construction costs through economies of scale. If you had four neighbors do the same where the four rear corners of the lot intersect, better still. Admittedly, getting two or four neighbors to coordinate is a stretch but in the age of social media a good city campaign might make it possible. That is interesting. I think you may be generally right (Vancouver has a built in advantage) but I have a feeling that Seattle is a lot more complicated than that, though. There are several Single Family Zoned areas (SF 5000, SF 7200, SF 9600). I have no idea what percentage of the city is each. Plus there are a lot of odd lots, and certainly many odd streets. This is especially true of the oldest and newest parts of the city. The oldest didn’t have as regular a lot size, and the newest tends to have an irregular grid (lots of “missing streets”). I think the key in all cases is to be flexible, and come up with regulations that are as liberal as possible, while enabling a system that works for that neighborhood (or that lot). Rick, a standard Vancouver BC lot measures 33’x122′ (metric: 10 x 37.2 m), which was originally platted by the Canadian Pacific Railway when it developed its government-given land grant (1880s) as payment to bring a railway across the mountain ranges of BC. In essence, the lots were 1/2 a 66′ chain wide and two chains long, with 10′ removed from the back end of opposed lots to create a 20′ utility lane. It was very profitable for the CPR. My half lot was created by subdividing two standard 33′ lots crosswise into four in 1910. There are several streets in Vancouver that are filled with these unusual configurations and they are delightful and much desired places to live today. What is truly mind-boggling is that these half lots are treated as full lots in the zoning bylaw, even though they predate the bylaw by a half century. Any major renovation has to obtain a variance. Yet with today’s affordability crisis in Vancouver (BC), front and rear lot subdivisions would be an ideal answer because they would allow freehold detached home ownership and offer prices about 1/3 less than full lots (the escalating value is in the land). @Robert Francis “Secondary units make it much harder for middle income families to buy housing since the 2nd unit makes the property more expensive.” This is an interesting point. We rented the mother in law apartment in our first house for many years, not to ‘get rich’ but just to help cover the mortgage. I think that’s pretty common. It’s easier, and good for everyone involved if you can charge ‘below market’ rent, but it seems in the nature of capitalism that persons (or corporations) willing to charge the max possible will end up owning these properties. Thank you for writing this. Seattle does need to remove the barriers. You could do another piece on the cost and relative affordability of rents. My mother-in-law apartment in a half-finished daylight basement with half bath cost $25k. Most homeowners are motivated to keep the rent slightly below market. Once we find a good tenant-housemate, we want to avoid turnover. Market in Lake City is $1,000/mo, so my 800 s.f. apartment is “naturally affordable.” It pays for my ever-increasing property taxes and utilities. The investment in a backyard cottage is many times higher and may involve major financing, so the economics are quite different, and the rent is likely to be market-rate. Please drop the planner-speak ADU/DADU language. If we want to promote them, let’s appeal to a broader audience. Dan, excellent article! Minor quibble: Portland does not have a Department of Environmental Quality. I’m curious where the ADU stats came from? Good catch Mike! It is the Oregon DEQ, now corrected. It may seem odd, but they are tracking ADUs, and authored the survey I cited. We also have permit data from the Portland Bureau of Planning & Sustainability that I could share with you if you’re interested. I’m wondering how many of the little Mother-in-law houses in Vancouver actually have a real Mother-in-law or other family member living in them? Or maybe they did at one time, back in 80’s or 90’s? Some of this might be cultural: I can think of certain neighborhoods and certain ethnic groups in my home town of Tacoma Washington who would be much more open to this sort of development. I’d love to see my town come up with some sort of senior housing credit that could be used for family members or others. Terry, a fair number of the Vancouver laneway homes were built in the backyards of parents who would rent them to their adult kids with growing families. “Rent” is relative. The adult kids may in fact be covering the mortgage payments. You are not allowed to subdivide off the laneway house, so the land cost is not part of the equation if you already own the lot. The parents then pass the main house on to the kids while they live in the small house out back, offering a built-in baby sitting service and security checks. Otherwise, they are straight rentals. I tend to agree with Robert Frances because of what I observe in my own north west Ann Arbor, MI neighborhood. Recently, when a house goes up for sale, it is not bought by a family, a couple, or a single person. Instead, it is bought by a speculator or a “flipper.” That speculator quickly increases the size of house–width, depth, and height–as much as the zoning will allow and then resells the, now much larger, house. That means that small, starter homes are disappearing. I suspect that speculators will use any relaxed rules regarding ADU’s and DADU’s that are passed here in Ann Arbor to increase their profits by building the ADU’s at the same time that they expand the size of the houses they buy. Prices for such properties will be very high and property taxes will be high too. If this is true, then eventually only the very well off will be able to afford to buy homes in Ann Arbor, and this is regrettable. I am a fan of DADUs; my firm has designed a few, and I have one behind my own Seattle house. I’m not, however, entirely supportive of Seattle’s HALA proposal, nor do I agree with Mr. Bertolet’s assumption that excessive regulation is entirely to blame for the dearth of ADUs in Seattle. The HALA proposal to eliminate required parking is commendable; I prefer to build houses for people rather than for idle cars. Perhaps Vancouver B.C. has a better transit infrastructure that can serve the increased density of single-family neighborhoods with ADUs. Unfortunately, Seattle’s mass transit has not kept pace with our population growth and we don’t have a stable funding source to build the transit we need. Waiving the parking requirement where transit exists (e.g. in walkable Urban Villages) is a fine idea, and it’s already on the books. I suspect that waiving the parking requirement where transit isn’t plentiful (e.g. my neighborhood) would increase the number of cars parked on the streets. Is that our goal? I appreciate Ms. Siegfriedt comments. I, too, am able to charge well-below market rate rent because a) my backyard cottage was built in 1926 and b) I prefer good neighbors to profit. The HALA recommendation to eliminate the owner-occupancy requirement would, I fear, put profits before people, by facilitating the work of real estate speculators. I’ve already seen their work in the single-family market: New houses in my neighborhood seem to maximize size and price, in ignorance or defiance of the market’s demand for smaller and less-expensive product. Would ADU/DADU development be any different? Construction in Seattle is expensive, and the HALA recommendations aren’t going to change that. An 800 square-foot cottage is a $200,000 project. ADUs are not likely to be a source of affordable housing. Mr. Bertolet’s protest against government regulation has political overtones. In the case of ADU development, I’d like to hear from the authors of the current regulations – did they write the regulation with a benefit in mind, and has it succeeded or failed? Who would win, and who would lose, if the regulations were eliminated? Hey Dan, I’m Martin, a co-editor of accessorydwellings.org . Great piece, that shows American cities how far we have to go! Portland would have far less of a housing crisis if we gained even a third of Vancouver’s proportion of ADUs. In terms of barriers to ADU development, definitely government rules and the general vigor of the real estate market matter. But I don’t think we should interpret all the differences between the cities with those factors. The numbers from the cities represent successes (homeowner-developers who have overcome barriers), but just as informative in terms of barriers would be the study of failures or near-failures (people who wanted to build an ADU but couldn’t — or nearly couldn’t). To the extent that I have been able to examine that in Portland, the suggestion is that the American mortgage bureaucracy, as much as any government regulation, is the problem. It’s often difficult to raise money to build an ADU even if you can make an awesome financial case for it. ADUs are often appraised way below their income-related value, and underwriters may not allow rental income in their calculations for approving the loan. I’ve helped build two ADUs in Seattle that never got permits and will probably build others. Great article. The idea that having 2 or 3 homes on one single-family sized lot is anti-affordability is ahistorical. Three flats were the mechanism for millions of immigrants and working class people to buy property and subsidize the cost through the sweat equity of being small landlords (and, of course, fixing their mortgage while rents rose). ADUs/DADUs can and should serve the same function – in fact that’s why the stat that 35% of Vancouver BC homes have ADUs is so important: it’s a strategy for not-rich homeowners deal with rising property taxes or accommodate their families. Terrible article. Doesn’t address the environmental impact on urban tree canopy at all. Policy prescriptions are a developer’s fantasy that will destroy neighborhoods and result in overbuilt communities.